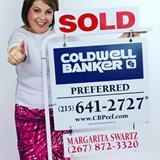 Margarita have been with Coldwell Banker Preferred for over 10 years. Coldwell Banker Preferred in Blue Bell, PA is a Company Owned by NRT/Realogy. She had achieved top producer status most recently Achievers Society 2013, 2014, Bronze Society 2014 as a Team Member, Sterling Society 2015 and now most recently Diamond Society 2016 & now 2017. Margarita is licensed realtor since 2002 specializing in various niches but in particular representing those from the Spanish speaking community, she has bought and sold over 1,000 properties worldwide in the past 18 years. Margarita designated ePro, CRS and Accredited Buyer Representative [ABR]. She is a graduate from The Philadelphia University with a Bachelor in Science and a minor in Chemical Engineering, worked in Chemical plants in South America specifically Venezuela and Germany, iProduct engineering sales, traveled Germany- Dusseldorf where she continued her education in Chemical Products for the Textile and leather industries, sales training engineering. Margarita is very active member with the Association of Realtors in Montgomery County and Pennsylvania plus a strong advocate with the NAHREP, National Association of Hispanic Realtors since 2002. Margarita has an award-winning background in residential sales, and She is extremely knowledgeable about the Montgomery County market. And most of all my commitment to customer service is unbeatable!